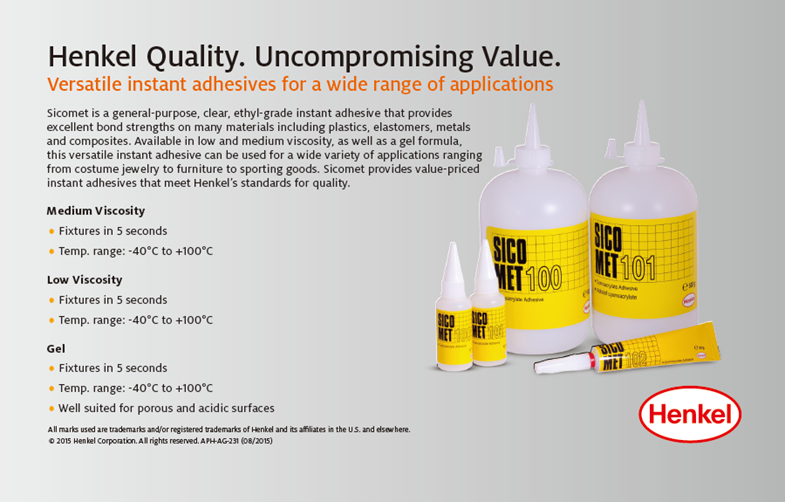 Sicomet is a general-purpose, clear, ethyl-grade instant adhesive that providesexcellent bond strengths on many materials including plastics, elastomers, metalsand composites. Available in low and medium viscosity, as well as a gel formula, this versatile instant adhesive can be used for a wide variety of applications ranging from costume jewelry to furniture to sporting goods. Sicomet provides value-priced instant adhesives that meet Henkel’s standards for quality.